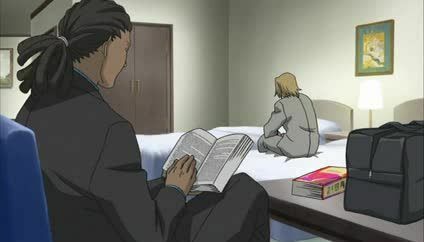 Stream anime episodes online for free, Watch Darker Than Black Episode 3 English version online and free episodes. Anime Episode guide, Chapter Darker Than Black Episode 3 English dubbed A New Star Shines in the Dawn Sky… (Part 1) A man, the only survivor of his expedition, explores the interior of the Gate and discovers a glowing flower. In the present day, Hei has breakfast and stops by a small store. A schoolgirl, Mai Kashiwagi, misses her train in the morning. Hei checks into a construction site to begin work and meets Kōzō Tahara, the man from the Gate expedition. Two men, monitored by Huang, check into a hotel and reveal their plans to use force to convince Tahara to obey them. Mai awakens in front of a fire and is sent home from her school. When Hei attempts to drive her home, she escapes and runs off with friends. Hei later makes contact with her and entertains her. However, they are attacked as they travel through the city. Mai reacts and an inferno is seen in her eyes as Kirihara is informed of a new star.